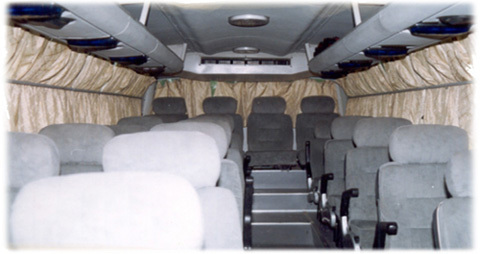 If there is a very large group of people then these large buses are the ideal mode of transportation due to their spacious interiors and excellent seating capacity. The seating capacity of the big bus is 32 persons including the driver with very comfortable, spacious and pushback facility in the seats. It is very sturdy vehicle to run on rough Indian roads like going through Rajasthan area or even climbing up on the hilly areas. If you have a large group of people and want to travel long journeys then this is an ideal mode of transport. It is a very comfortable mode of transport in India. The facility of Ice Box to keep the drinks cold is also available in these buses. Normally for the groups we also send a co-driver who takes care of the bus and as well as of your baggage.